Some time ago my brother and I having been inspired by shows such as ghost hunters and other paranormal shows decided to do a little ghost hunting. We heard about a cemetery with a local ghost who hitch hikes at night. The rumor is that if you drive by at night the passenger door to your vehicle will open as a ghost gets in for a ride. So we went and drove by the cemetery several times and nothing happened. After this we decided to go to another cemetery located on bug ridge near the Elizabeth chapel. Now this cemetery is divided into two plots of land. One close by the chapel itself and one a small ways up the street. The second one not close to the chapel is where we had our only experience of the night. While we were walking through the dark cemetery we both carried video cameras and I was snapping random pictures with my digital camera. Not long after being there and asking anyone who may be listening if they wanted to speak my brothers video camera suddenly died. He had a full battery when we got there and it had only been running maybe ten minutes. I was snapping photos when this happened and told him that sometimes when a camera shuts off or the battery dies suddenly that it may be a spirit trying to manifest itself. After saying this my video camera died and it had 3 / 4 of a battery. My brother quickly lost his resolve and insisted that we leave right away. When we got home none of the footage that we captured on our video cameras were there. It was mysteriously absent. I know we both had them on and recording the whole time. Skeptics probably think there is a possibility that one of us had made a technical mistake and forgot to hit record (something I know didn't happen) but both of us? 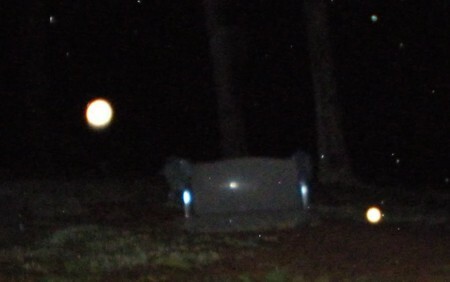 When I reviewed the pictures I had taken there was one of an orb.